Posted on July 28, 2014 by Mark Pajor. Though neither will be here to see the opening of the ECE Building, Frank and Irene Low were among the first to realize the impact a new facility would have on the department. In 2001, they designated a $7 million estate gift to ECE with the intent of supporting a new building for the department. In honor of their incredible vision and generosity, the southwest wing of the building’s first floor will be named the Frank D. and Irene M. Low Classroom Wing. The Frank D. and Irene M. Low Classroom Wing provides a key secondary entrance to the building on the Wright Street side. The wing is home to two 113-seat classrooms. Both classrooms feature a tiered design ideal for lectures, conferences, demonstrations, public seminars, and other events. Outside the classrooms, naturally-lit student seating is built into the hallway. 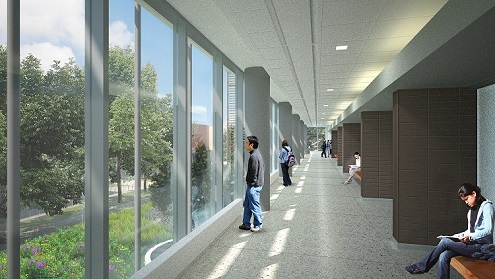 Once the building’s landscaping is complete, the hallway’s grand windows will overlook the building’s native-plant garden. Thousands of students will pass through the wing every year, benefiting from the Lows’ gift to the department. The Lows wanted their gift to aid construction projects, knowing that large-scale investments like the ECE Building would be a key to the department’s long-term success. Their donation expresses their dedication to ensuring a strong future for engineering students at Illinois. Frank, as a department alumnus, understood how important advanced facilities would be for ECE to maintain its position as a leading source of innovation and instruction in the field. Frank Low, born November 14, 1912, earned his bachelor’s degree in electrical engineering from Illinois in 1934. He grew up in St. Genevieve, Missouri, and Davenport, Iowa, where he graduated from high school. At Illinois, he was a member of the Beta Psi and the Pi Tau Pi Sigma societies. After graduation, Frank first worked for Sangamo Electric Cooperative in Springfield and then, starting in 1947, he spent the bulk of his career at General Electric as an engineer in the Hotpoint Appliance Division. He held 34 patents, mainly for electrical components of washing machines and dishwashers. He earned a place in GE’s Hall of Fame for his distinguished and successful career. Frank passed away December 26, 2001. Irene Low, born October 11, 1912, grew up in Evanston, Illinois, attending Evanston High School. She earned her bachelor’s degree at Northwestern University while participating in cheerleading and basketball. After graduating, she earned a master’s degree in psychology at the University of Chicago. Dedicated to education, she spent part of her career as a teacher at the Illinois School for the Deaf and Blind. Irene joined the University of Illinois Presidents Council in 2002 and was a member at the Laureate Circle level. She passed away December 22, 2009. This story was originally posted on the ECE ILLINOIS website.